Spring salutations to the music video loving masses! It’s Andy Gesner and the staff from HIP Video Promo, back with another remarkable clip from a most unusual rock band. 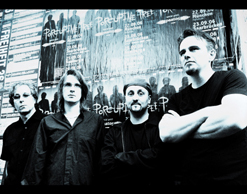 Porcupine Tree has been setting its own course for more than fifteen years, supporting their acclaimed albums with ferocious live shows and innovative visuals. By this point, it’s almost a cliché to say so, but it bears repeating: there’s no group quite like them, and their strict adherence to their own principles has won them a passionately devoted and genre-be-damned fan base. Metalheads love them for their grim textures, bleak lyrics and delivery, and uncompromising stance. Modern rock listeners admire their cinematic soundscapes and for Steven Wilson’s magnificent guitar playing. The English literati have always adored the band for their willingness to tell extended stories through song (their last album, the brilliant Deadwing, was an elaborate and near-Gothic tale of a haunting.) And prog-rockers appreciate Porcupine Tree’s willingness to stretch out on multi-part epics and incorporate lengthy, dazzling instrumental sections into their pieces. Wilson likes to boast that his band is the only act in the top 40 with an eighteen-minute song; so far, he hasn’t been challenged. Danish filmmaker Lasse Hoile tethers Wilson’s narrative for “Fear Of A Blank Planet” to a clip that makes reference to contemporary controversies yet seems timeless nonetheless. His protagonists are a gang of teens who are disturbingly ordinary: they go to school, they play video games, they put posters on their wall and dream of escape. But they’re also guzzling prescription pharmaceuticals by the handful, and when they do, their eyes turn the transparent pale blue of a television set on the fritz. They’re receiving transmissions from another zone; they’re unreachable, frightening, adversarial. And then something snaps – perhaps it’s the chemicals, perhaps it’s the electronic stimulation, and perhaps its some strange alchemy between the two. The clean-cut kids become destructive, chucking Molotov cocktails at a car and smashing its headlights with a baseball bat, pointing weapons at each other, fighting, impassively threatening the camera, their peers, their surroundings. It’s a portrait of modern nihilism that’s at once extraterrestrial and all too believable. Don’t avert your eyes from it: watch, and listen. We are very excited to be working with Andy Leff and Anthony Delia to bring you this genre-busting new clip. We have lots of copies of Fear Of A Blank Planet on hand for all of your on-air giveaway needs. Porcupine Tree will also be touring the US during the month of May, so don’t hesitate to be in touch if you’d like to set up a video interview when they come to your market. If you need more info, call Andy Gesner at 732-613-1779 or e-mail us at HIPVideo@aol.com. You can also visitwww.AtlanticRecords.com, or www.PorcupineTree.com to find out more about Porcupine Tree.